How we can help reverse the loneliness of those single looking to be married. The best way that we can make an impact on this widespread and painful problem is through taking upon ourselves to make a difference, one person at a time. I would like to suggest some ideas to start. Feel free to use the comment section below to share your ideas. Every time you meet someone single who you are impressed with, think of who you might know of for them. Write their name and contact information down for the future in case you can't think of an appropriate idea right now. Keep a list of everyone you know that is single, and add to it as you meet new people. Through your natural network of family/friend/community contacts, you probably know many more singles than you realize. Keep one list of all the single men that you know of, and a separate list of all the single women. Only include individuals whose character and presentation you are impressed with. Every week, take one name from your list and cross-check against the list of the opposite gender. You will probably come up with more ideas for matches than you realized possible. Be proactive on behalf of your single friends. Choose one single person and try to network on his or her behalf. Call up relatives and friends, especially those who know many different people (i.e. teachers, rabbis, businesspeople), and describe this person to see if they have any ideas for them. Be persistent. If you think of an idea for a match, follow through on it. If the person that you thought of is unavailable, check back with them in a few weeks. If you mentioned the idea to the interested party, don't leave them hanging. Get back to them with the status of the match. Put some thought into your match ideas. Set people up based on their stated preferences, life philosophy, religious orientation, and interests. "He's tall, she's tall" is not enough -- and it's not fair to the singles who may be emotionally drained after having already dated 100 people looking for the right one! Get you single friends to define their life goals, and criteria for choosing a spouse. Have your single friend describe the four unique qualities that define them, and the four top qualities they are looking for in a partner. Besides helping your friend clarify his/her future, this will make your job as the matchmaker immeasurably easier. Be respectful of the decisions that singles make, and do not second-guess them or give unsolicited advice. Do not push them into dating someone that they do not want to go out with, and don't make them feel as if your match idea is their last chance to get married. Be discrete. Guard the privacy of the singles that you are helping and do not repeat details of their dates to others. Don't make the single status of your friends the focus of all your conversations with them. Don't ask them about their dating life unless they bring up the subject. Singles successfully develop their careers, engage in spiritual pursuits and pursue multi-layered interests. There is much for them to talk about, yet sadly they are often defined by the one thing they still seek. Don't think that you have to be a proven "matchmaker" in order to set people up. Anyone can set up a match, as long as you persevere and use common sense and compassion. Even if you don't know the parties well, they will only be flattered and touched if you call them to suggest an idea or clarify what they are looking for. If you want to take your involvement to the next level, you can become a registered matchmaker at www.SawYouAtSinai.com, a website that matches singles with matchmakers. The site allows you to choose prospective matches from thousands of singles worldwide, whom you would otherwise not have had access to. Keep trying. Don't get discouraged if your match ideas don't seem to be working out. (Imagine how the singles feel!) The Talmud says that that making a match is as difficult as splitting the Red Sea! But the reward of success is enormous. Every match that is made spawns eternal results -- for the singles who are now complete, for their descendants, and for the community. 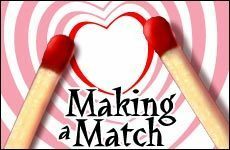 The Talmud says that since creation, God has been spending His time making matches. What a great opportunity for us to get involved and help! Tzivy is a Licensed Clinical Social Worker who currently works at Ohel/Bais Ezra supervising services to the developmentally disabled population. He is also a shadchan for SawYouAtSinai.com.